Marie Madeleine Jarret de Verchères is a heroine of Canada whose mighty deeds have been largely forgotten over time. The daughter of French aristocrats who had settled in Verchères (now part of Quebec, Canada), Madeleine grew up in a fort along the St. Lawrence River. In October of 1692, Madeleine and her younger brothers, Louis and Alexander, were at the Verchères fort. Their father was away from the fort and their mother had just gone to Quebec on business, taking her younger children with her. Most of the men in the fort were out working in the fields, and many of the fort’s soldiers were standing guard over them. The fierce Iroquois, a tribe of Native Americans who hated the French, had been attacking French settlements during this time and it was unwise for settlers to go outside their colonies alone or without arms. October 22, 1692, began calmly and quietly, as had the day before. But it was not to remain quiet. Midmorning had barely arrived when a large band of Iroquois braves suddenly attacked the fort. Most of the male settlers were killed where they worked in the fields, and the guards died similarly. As the oldest member of the Verchères family present in the fort, Madeleine assumed command of the people there. She closed the fort’s gates and told her younger brothers and an old soldier, who had remained inside the fort due to his age, to take up arms and prepare to defend the settlement. Rushing to the blockhouse powder room to get a gun, Madeleine found that there were two other soldiers, whose duties had kept them in the fort, in the powder room already. To her horror and disgust, she learned that at least one of the soldiers was preparing to blow up the powder room in order to destroy the fort. This was to prevent the Iroquois from getting inside the colony, where they would kill them and the remaining settlers – almost all of whom were women with infants and young children. Madeleine gave the two soldiers a furious scolding, reprimanding them harshly for their cowardice in despairing of their situation. She ordered the two out of the blockhouse, then got the gun and powder she had come for and left. She directed the defense of the fort, her only forces being her two brothers, the old soldier, and a few other able settlers. The little group stood off the Iroquois until help arrived from Montreal a week after the siege began. Some reports and retellings of Madeleine de Verchères’ story say that she did not sleep for the first two days of the siege. They also say that she went about her warrior’s duties with a pleasant smile and attitude to keep up the courage of the other women in the fort, who were not only afraid for their lives and the lives of their children but were also grieving for their husbands and sons who had been slain in the fields by the Iroquois. At the time of the attack Madeleine de Verchères was fourteen years old. Madeleine de Verchères fades from history after this event. Little is known about the rest of her life other than the facts that she was awarded a pension by the French crown for her heroism and that she married a man named Pierre Thomas Tarieu de la Pérade in 1706. It is said that Madeleine again showed her strength of character by saving her husband’s life in 1722 when he was assaulted by an Indian. It appears that her marriage remained childless. 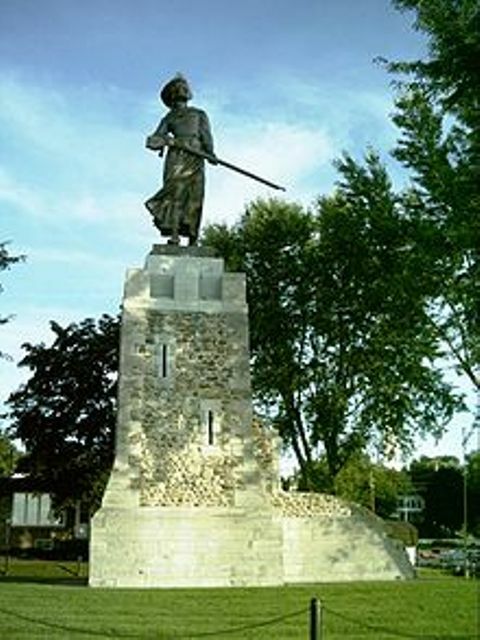 She died August 8, 1747, and a statue of her stands in Verchères, the only reminder of the fourteen year old colonial girl who led the defense of her family’s settlement – and won. May she never be forgotten! Encyclopedia Americana: Vol. 28, 2002, page 16. Madeleine Takes Command by Ethel C. Brill. This entry was posted in Essay and tagged aristocrats, Canada, children, colonies, Encyclopedia Americana: Vol. 28, Essay, Forts, French Canada, Historical Women, Iroquois, Madeleine de Verchères, Madeleine Takes Command by Ethel C. Brill, Marie Madeleine Jarret de Verchères, Montreal, Native Americans, North America, October 22 1691, Quebec, settlements, settlers, St. Lawrence River, Strong Women, women and children on October 22, 2015 by The Mithril Guardian.